"Walmart.com is a lot like your neighborhood Walmart store. We feature a great selection of high-quality merchandise, friendly service and, of course, Every Day Low Prices. We also have another goal: to bring you the best shopping experience on the Internet." 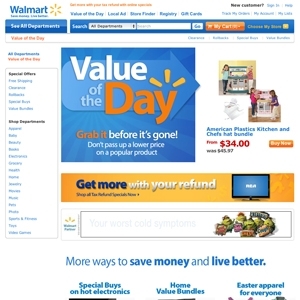 The Walmart.com 'value of the day' spotlights one item from a random category and is offered at a discount for one day only. Walmart.com currently ranks #3 amongst sites offering online deals -- Ebay ranks #2. In the General Merchandise category, Walmart ranks, once again at #3 -- Ebay.com again ranks slightly higher and the same as before, at #2.